In 1934 Fulgencio Batista took over the Cuban government in what became known as "The Revolt of the Sergeants." For the next twenty-five years he ruled Cuba with an iron fist, and the full blessing and endorsement of the United States government, who feared a social and economic revolution and saw him as a stabilizing force with respect for American interests. Batista established lasting relationships with organized crime, and under his guardianship Havana became known as "the Latin Las Vegas." Meyer Lansky and other prominent gangsters were heavily invested in Havana, and politicians from Batista on down took their cut. Through Lansky, the mafia knew they had a friend in Cuba. A summit at Havana's Hotel Nacional, with mobsters such as Frank Costello, Vito Genovese, Santo Trafficante Jr., Moe Dalitz and others, confirmed Luciano's authority over the U.S. mob, and coincided with Frank Sinatra's 1946 singing debut in Havana. It was here that Lansky gave permission to kill Bugsy Siegel. Many of Batista's enemies faced the same fate as the ambitious Siegel. Nobody seemed to mention the many brutal human rights abuses that were a regular feature of Batista's private police force. Nobody, that is, except the many in Cuba who opposed the U.S.-friendly dictator. 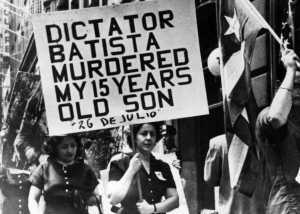 Batista was ousted by Castro and the Cuban Revolution and left the country on January 1 1959. He died in 1973. Learn more about Fulgencio Batista | Gerardo Machado | An excerpt from the book by Robert Lacy: "Little Man: Meyer Lansky and the Gangster Life"